Looking for movie tickets? Enter your location to see which movie theaters are playing Black Sunday / Two-Minute Warning near you. 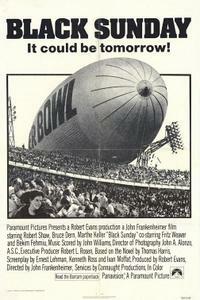 BLACK SUNDAY, 1977, Paramount, 143 min. Director John Frankenheimer (THE MANCHURIAN CANDIDATE, THE TRAIN), collaborating with screenwriter Ernest Lehman, adapts the novel by Thomas Harris (THE SILENCE OF THE LAMBS) into a taut suspense thriller. Israeli agent Robert Shaw is on the trail of Marthe Keller, a Black September terrorist operative intent on manipulating deranged Vietnam vet Bruce Dern into piloting the Goodyear blimp in a plot to kill thousands during the Miami Super Bowl. Fritz Weaver (DEMON SEED) is Shaw’s American FBI liaison. <br /> TWO-MINUTE WARNING, 1976, Universal, 115 min. Dir. Larry Peerce. A sniper want to unleash his weapon on a packed football stadium, and police chief Charlton Heston joins forces with SWAT team sergeant John Cassavetes to capture the psycho before he opens fire on the fans, who include Gena Rowlands, Jack Klugman, David Janssen, Walter Pidgeon and Beau Bridges.